PRAYER (traditional language): Merciful God, who didst call thy servant Macrina to reveal in her life and her teaching the riches of thy grace and truth: Mercifully grant that we, following her example, may seek after thy wisdom and live according to her way; through Jesus Christ our Savior, who liveth and reigneth with thee and the Holy Spirit, one God, for ever and ever. Merciful God, who called your servant Macrina to reveal in her life and her teaching the riches of your grace and truth: Mercifully grant that we, following her example, may seek after your wisdom and live according to her way; through Jesus Christ our Savior, who lives and reigns with you and the Holy Spirit, one God, for ever and ever. Lessons revised at GC 2009. Basil the Great is remembered as the founder of Eastern monasticism. All Eastern Orthodox monks are Basilian monks and follow a variation of the monastic rule that he outlined. However, it is often overlooked that the community of monks organized by Basil was preceded and inspired by a community of nuns organized by his sister, Macrina. Macrina the Elder lived in the days of the Emperor Diocletian, who made a determined effort to destroy the Christian faith. She and her husband fled into hiding, and survived into the time of Constantine. One of their sons, Basil the Elder, and his wife Emmelia, had several distinguished sons, including Basil the Great (see 14 June), Gregory of Nyssa (see 9 March), Peter of Sebastea, Naucratios, and (according to one ambiguously worded communication) Dios of Antioch. Their oldest offspring, however, was their daughter Macrina (called Macrina the Younger to distinguish her from her grandmother). She was betrothed at the age of twelve, after the custom of the day, but when her fiance died, she determined to devote her life to prayer and contemplation and to works of charity. After the death of her father, she and her mother formed a community of women who shared her goals. She often brought poor and hungry women home to be fed, clothed, nursed, or otherwise taken care of, and many eventually joined the community, as did many women of means. 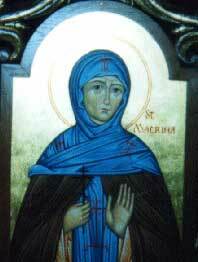 After the death of their parents, Macrina was chiefly responsible for the upbringing of her ten younger brothers. When they were disposed to be conceited about their intellectual accomplishments, she deflated them with affectionate but pointed jibes. Her example encouraged some of them to pursue the monastic ideal, and to found monastic communities for men. (Dios founded one of the most celebrated monasteries in Constantinople.) Three of them (Basil, Gregory, Peter) became bishops, and all of them were leading contenders for the faith of Nicea against the Arians. Gregory, in his Life of Macrina, records his last visit with her, and her farewell speech and her prayers and teachings about the resurrection.